This summer, Colorado’s smoky haze, wildfires, low water levels and hot temperatures provided reasons to worry about the state, the American West and the planet, for that matter. 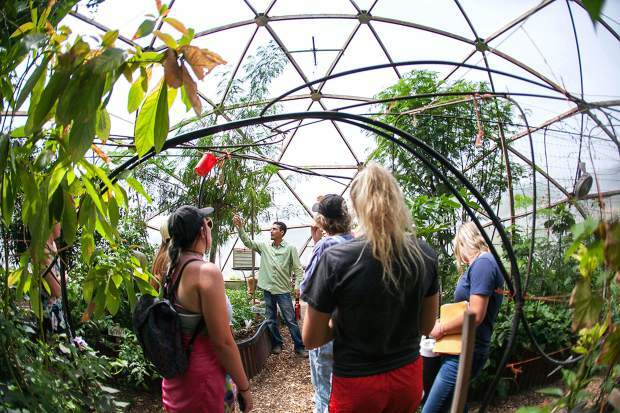 For a group of sustainability studies students taking permaculture courses at Colorado Mountain College, the effects of climate change and a passion for the environment are motivating them to discover ways to help solve real ecological challenges. On a recent summer day two dozen students, faculty and staff from CMC Spring Valley at Glenwood Springs and CMC Steamboat Springs gathered at The Farm Collaborative at Cozy Point Ranch near Aspen to study, collaborate and work at the organization’s 14 acres. Originally called Aspen TREE, The Farm Collaborative is a 10-year-old nonprofit that expanded its lease this spring with the City of Aspen. It’s working to stimulate a global movement toward healthier relationships among food, people and the land. Eden Vardy is The Farm Collaborative’s founder and executive director. He’s also an adjunct faculty member at Colorado Mountain College. An advocate of regenerative agriculture, which aims to increase biodiversity and improve water cycles, and to create resilience to climate fluctuation, Vardy and The Farm Collaborative provide a working example of how a healthy food ecosystem can look. That creativity extends from The Farm Collaborative’s site to CMC students, who are working on permaculture projects at the Spring Valley campus and at the collaborative’s site. One CMC student, for example, is designing a U-Pick orchard, while other students are pitching in at a variety of small farms and ranches throughout the Roaring Fork Valley. CMC sustainability studies major Monique Vidal is a mother of two and an interior designer from Carbondale. She said she’s always been passionate about nature. As an 8-year-old growing up in southern California, she saw a kid poking an octopus and told him to stop. “I told him, ‘How would you like it if someone did that to you?’” she said. That same caring attitude is why she’s pursuing her degree in sustainability studies. Currently, she’s working alongside fellow sustainability studies student Sergio Ortiz. A veteran deployed in 2005, Ortiz is now involved in a vocational program for veterans. Vidal and Ortiz are developing a rotational grazing program for the animals at CMC Spring Valley’s veterinary technology farm. Vidal said they’re mitigating the nitrogen in the fertilizer in the field above the farm. Their goal is to improve the overall health of the field and the aquifer adjacent to it. “We’re working and helping CMC while getting our bachelor’s in sustainability studies,” she said. “It’s pretty exciting,” said Samantha “Sam” Hankinson, who grew up in the Roaring Fork Valley, graduated from Bridges High School in Carbondale and is earning her bachelor’s degree in sustainability studies at CMC Spring Valley. “These kinds of community ties allow us as students to thrive,” she said. Carrie Click writes features for Colorado Mountain College’s public relations department.